A new superconducting magnetic heat shield has been developed by European researchers to protect spacecraft from the heat of reentry. EADS Astrium, with support from German aerospace centre DLR and the European Space Agency, created the device. The magnetic heat shield will be launched from a submarine on a suborbital trajectory to land in the Russian Kamchatka region. 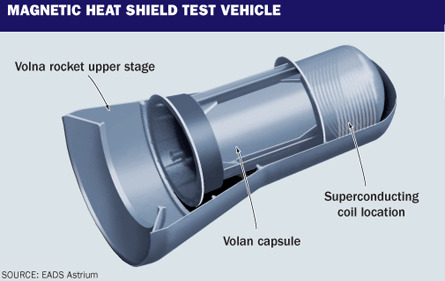 As the air heats up around the test vehicle, the shaped magnetic field from the superconducting coil should deflect hot atmospheric gases away from the vehicle's surface. In theory, this should either eliminate the need for ablative materials or cut down on their use, which could save weight on the total vehicle and thereby increase payload. This is an ongoing area for spaceflight research. The US Centennial of Flight Commission states "Although various people, including Wernher von Braun and experts at Douglas Aircraft Company's Project RAND, had studied spaceflight during the 1940s, nobody began thinking about how a vehicle would actually return from space until the early 1950s." Actually, Robert Goddard did think about it. He wrote in 1920 "... if the outer surface of the apparatus were to consist of layers of a very infusible hard substance with layers of a poor heat conductor between, the surface would not be eroded to any considerable extent..."
E.E. 'Doc' Smith wrote in detail about an ablative shield in his 1934 novel Triplanetary. Another sfnal take on this story is to refer to the idea of a "shield" or "deflector shield" that a spacecraft could project to defend itself from harm. See the story Deflector Shields For Spacecraft? for more discussion of this topic. Via Flight Global with thanks to Winchell Chung.